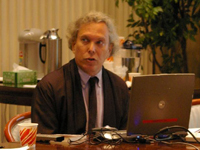 Barry Sautman is associate professor, Division of Social Science, Hong Kong University of Science and Technology. His research concerns ethnic politics and nationalism in China, as well as China–Africa relations. He published joint publications with Yan Hairong on China-Africa links including: East Mountain Tiger, West Mountain Tiger: China, Africa, the West and “Colonialism,” Maryland Monograph Series in Contemporary Asian Studies no. 186 (2006); “Friends and Interests: China’s Distinctive Links with Africa,” African Studies Review 50(3): 75-114(2007); “Fu Manchu in Africa: The Distorted Portrayal of China’s Presence in Africa,” South Africa Labor Bulletin 31(5): 34-38(2008); “African Perspectives on China-Africa Links,” China Quarterly 199:729-760 (2009).